In his book, Choral Music in the 20th Century Nick Strimple describes Lauridsen as “the only American composer in history who can be called a mystic (whose) probing, serene work contains an elusive and indefinable ingredient which leaves the impression that all the questions have been answered …” From 1993 Lauridsen’s music rapidly increased in international popularity, and is the most frequently performed American choral composer. 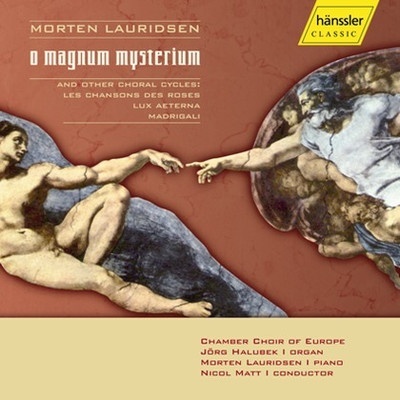 The music of Morten Lauridsen occupies a permanent place in the standard vocal repertoire of the Twentieth Century. His seven major vocal cycles – Les Chansons des Roses (Rilke), Mid-Winter Songs (Graves), Cuatro Canciones (Lorca), A Winter Come (Moss), Madrigali: Six “Firesongs” on Renaissance Italian Poems, Nocturnes (Rilke, Neruda and Agee) and Lux Aeterna – and his series of sacred a cappella motets (O Magnum Mysterium, Ave Maria, O Nata Lux and Ubi Caritas et Amor) are featured regularly in concert by distinguished ensembles throughout the world.